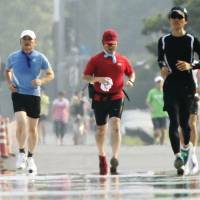 Japan is preparing measures to prevent heat-related health problems at the 2020 Summer Olympic and Paralympic Games in Tokyo, such as improved temperature forecasts and cooler roads paved with heat-resistant materials. Government agencies reported the measures during a meeting on June 7. Battling the heat has also been a major issue for past Olympic and Paralympic events. The 2020 Olympics will be held during the hot and humid period between July 24 and Aug. 9, and the Paralympics between Aug. 25 and Sept. 6. The situation may be exacerbated by the urban-heat-island effect, where the metropolitan area is notably warmer than nearby areas due to human activity. For both the athletes and spectators, coming up with measures to prevent heat-related health problems is a “pressing task,” Prime Minister Shinzo Abe has said. The Meteorological Agency hopes to improve its temperature forecast accuracy by making full use of the data from its Himawari-8 and-9 weather satellites and supercomputer system. The satellites are said to lead the world in observation capabilities. “Our aim is to provide detailed information as soon as possible,” a government official said. 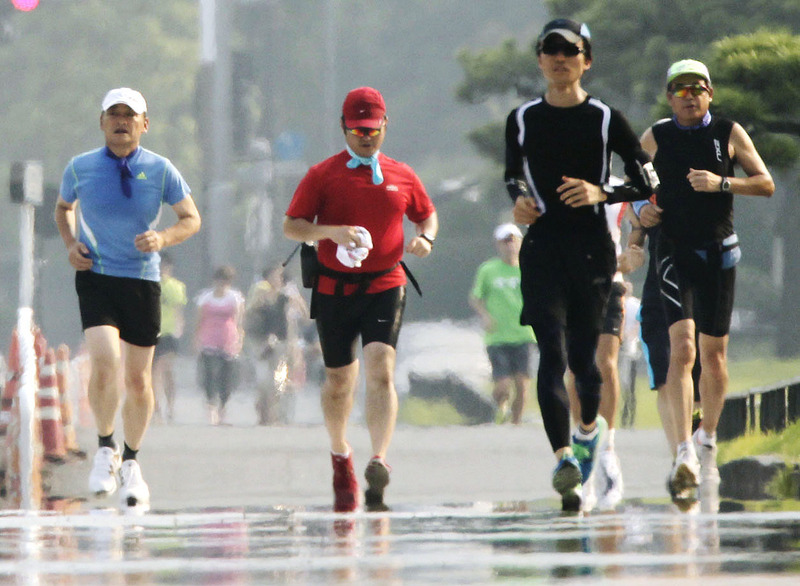 Heat and humidity are expected to affect marathon runners and spectators in particular. The land ministry plans to pave the marathon course with heat-resistant materials. It will also prune roadside trees to create more shade for spectators. The economy ministry hopes to encourage building owners along the marathon course to apply heat-resistant paint to the structures’ external walls. Another important issue is how to support spectators not used to Japan weather. The health ministry plans to make medical institutions more accessible to foreigners. The Fire and Disaster Management Agency has created a guide for ambulance services in seven languages, including English and Korean. The agency also plans to introduce a voice translation app for ambulance crews. Meanwhile, the Japan Tourism Agency will make more information about medical institutions available for foreign visitors. The government hopes that its application of measures to counter heat for the Olympic Games will leave a lasting impression, officials said.